Bay Lake Charters is owned and operated by Captain Adam Cochart. 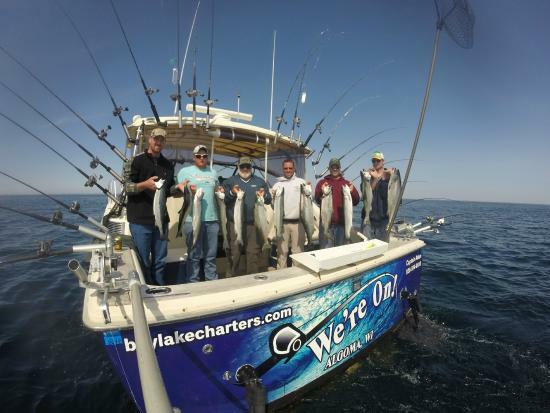 Captain Adam runs a full-time charter fishing service, providing guests with the experience of a lifetime – fishing on Lake Michigan out of Algoma, Wisconsin. We offer full and half day charters along with deluxe fishing packages, which include your lodging, licenses, cleaning and bagging of your catch, a light breakfast, and many memories! Bay Lake Charters (www.baylakecharters.com) also accommodates large groups and corporate outings by working with other, respected charter businesses. With over two decades of fishing experience locally, Captain Adam has the knowledge to lead his crews on rewarding fishing trips all season long. 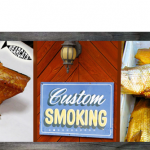 He works collaboratively with fellow captains to follow the best bite, which leads to excellent results for his customers. His knowledge of how to catch fish in all conditions, as well as the professionalism it takes to be successful, makes him well respected within the charter fishing industry. Our boat, the “We’re On!” is set up as the ideal Lake Michigan fishing boat. A large back deck welcomes anglers to the dance floor for fighting and landing the biggest salmon and trout, which Lake Michigan has to offer. With top of the line gear, electronics, and tackle our crew has all of the tools to make sure We’re On! 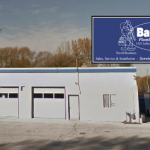 As the owner/captain of Bay Lake Charters, you will work directly with Captain Adam from the booking of your trip, to the farewells after you head home with a cooler full of fish. This ensures that all your questions are answered and everyone has a great fishing experience. Bay Lake Charters prides itself on going above and beyond your expectations, to make fishing partners and friends for years to come. Call Captain Adam at 920-594-0910 and let’s talk fishing!